Disclaimer: I am a Salesforce MVP and a soon-to-be employee of Convio, a Salesforce partner. Even though I have some insider knowledge through the Salesforce MVP program, I am not using any of that information in this post. The critical opinions and speculation I express below are entirely my own based solely on own experience. It’s not even winter yet and we can poke around and see what’s coming in Salesforce’s next release, Spring ’12. I got my pre-release org yesterday and spent a few minutes exploring it. 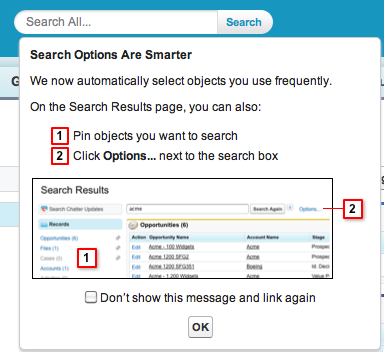 At this point, we’re flying a bit blind since the “Discover Spring ’12” link in the corner leads to a “not found” page. The newly revamped Salesforce Ideas is a good place to begin to explore what’s new. It has tagged ideas that are “Coming in the next release.” These are user-submitted and voted up ideas. Some are huge. And disappointing. Note that not all new things in Spring ’12 come from the Idea Exchange. There are some other things I’ve noticed right away which I’ll get to at the end. Update: Thanks to @aognenoff for pointing out that the release notes are in the Help & Training section. Sure enough. Let’s start at the top… Exception Reporting, also known as Outer Joins. Over 4000 users clicked the button to say this was something they wanted/needed. 9 other ideas merged into this one. Over 180 comments for years. I kind of like to call this the “raise your hand if you’re not here” report. Show me all the accounts that don’t have opportunities. Show me everyone who didn’t participate in an event. Sounds simple on the surface, apparently not so easy to do. There’s a great 3rd party app, Apsona, that has exception reporting built in but the reports generated by the app can only be downloaded or viewed in the app. They can’t be added to a dashboard, for example. I know there are many other 3rd party applications that enhance reporting, some probably have a steep price tag. Next there’s the ability to report on multiple children at the same time. This is very, very cool. Right now, you can report only in a parent -> child -> grand child line. There’s no parent -> sibling/sibling reporting. No show me everyone who has opened a case and made a donation. I have built a number of custom objects, most are the children of the account or contact. I continuously run in the same wall when I can’t report on all objects related to a contact or its household at the same time. How about Campaign inclusion reports? I have to be honest and feel a tad smug on this one. Convio Common Ground already has a rather nice campaign segmentation tool which does this kind of “Show me everyone who is in Campaign A but not in Campaign B” type work quite nicely. There are other tools/add-ons that have helped close this gap as well. This is a huge thing for nonprofits. All of the above features/ideas are coming in the next release! At last! Paar-tay! Not so fast. This functionality will be included in a new package from Salesforce called the Analytics edition. An add-on. Additional cost. Per user, per month. Every user must play. Ouch. Perhaps in direct response to criticism I expressed on the internal MVP forum for the misleading “Coming in the next release” tag, the product manager for Analytics posted a blog explaining that these ideas while indeed coming, was coming at a price. I won’t speculate here as to what that price is, but I’ve heard rumors and suffice to say, it may be tough for smaller organizations to swallow even with the Foundation’s discount. To me, this feels like instead of fixing the rusted pipes, Salesforce has developed a really cool, super-special brand of bottled water and they’re selling that. I get that the new Analytics package is awesome. It’s probably going to be the best business intelligence tool out there. But I’m not looking for really cool, super-special bottled water. I want to be able to go to the sink, turn the tap and drink. I want to be able to report on two objects that are siblings of each other. I want to be able to edit a report to add in an additional object without having to start over with a new report. Is that really best-of-class business intelligence? There seems to be a trend at Salesforce lately to sell add-ons and modules rather than fix the #core…unless it’s Chatter. It’s worrying me. And I can’t help but wonder where it might lead…when the most popular idea, multiple contacts on an activity, is finally done will it be delivered in a “Contacts Edition” because it took so much to make it happen? I hope not. Update 1/31/2012: Salesforce does the right thing and all this goodness will be included in Enterprise Edition for no additional charge. 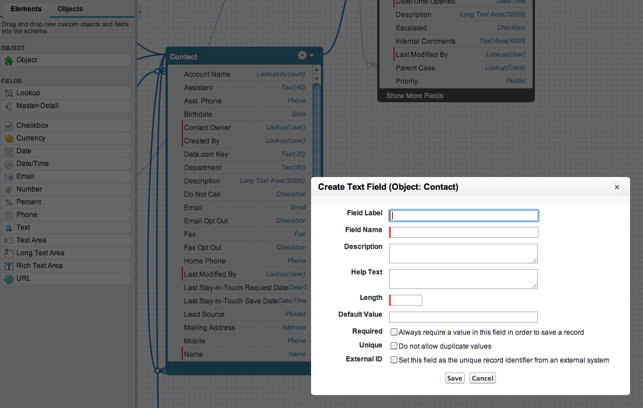 There’s an expansion of the cross-object workflow field update functionality. I’m bummed that I’m leaving FightCRC before this is out, because there are a few areas where this will be very helpful. Used to be that you could only update the parent object in a workflow rule if both the objects were custom. 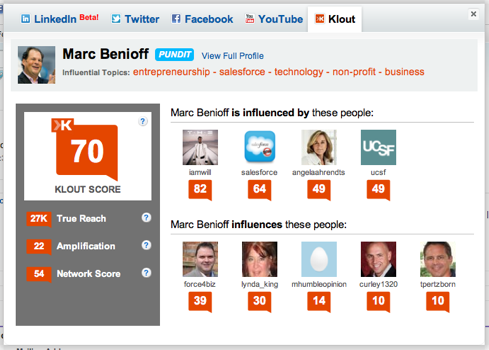 Now this functionality is improved so you can update the Account based on Opportunity. You can also update an Opportunity based on something happening on the Opportunity Product. And you can update some standard objects from changes on child objects. There’s also a nice feature that will be part of base analytics so you can drag & drop filters in the report builder. I admit that more than once I filtered down to a field in the left hand column, only to remember that since it’s a filter, I have to click somewhere else. Nice touch, and works exactly as you would expect in the pre-release org. 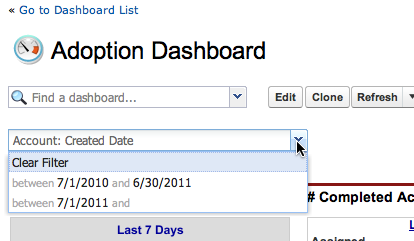 You can add dates to the new dashboard filters. The Idea Exchange says that the default view on reports should be “All Items” rather than the hated “Recently Viewed.” But I don’t see that implemented in the pre-release org yet. With the new drag & drop report filtering you’re no longer limited to just 10 items, and it’s a nice touch that filtered fields are highlighted in the field list. And finally, the Idea Exchange indicates that we can tell which end is up in the schema builder, but it doesn’t mention that you can now create fields right from the schema builder by dragging the field type to the object. Interesting. Still no printing though. 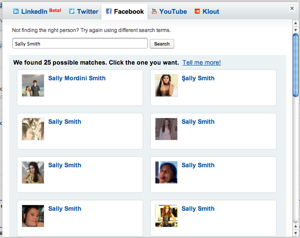 The most obvious difference on first login to Spring ’12 is in Social Contacts. I’m still not sold on it, mostly for reasons that my fellow-MVP Elizabeth Davidson explained on her blog. But it’s better than it was before, and since it’s social, it will likely get continuous attention. What have I missed? I’ll edit/add to this post as I find out. Hey judi…thanks..spring 12 is really amazing features.. Disappointing that they seem to be going this route: Hey look at the idea they want most, let’s deliver it and charge for it. Starting to research new sales force automation and CRM solution…priceless. Very nice to see they are improving reporting functionality rather than just changing the UI again. Chris, any company that plans on using all those features should really consider investing in a full time Salesforce developer/admin. For instance, Visual Workflow – $300 per user per year to view flows….funny part is a license is not required to use the flow if it is embedded in a Visualforce page. Really all you need is 1 license to create the flow and 1 line of code to allow all users (including non licensed users through force.com sites) access to the flow. There are hundreds of other instances like this you can leverage to keep costs low. Very nice article Judi. I am also getting the ‘oops this page is not available’ on the Discover Spring 12 link. Trying to keep a positive outlook on analytics edition but it leaves a bad taste. Seems indicative of a shift from the really-awesome-product mindset to $$s. Judi, very nice article. Thanks for mentioning Apsona. I did want to mention that Apsona also includes the ability to report on multiple children at the same time – you probably intended to say that anyway. I didn’t realize that there would be a charge for the upcoming analytics edition. Would it make sense to compare its features with other reporting add-ons available on AppExchange? Just hear that it is $98 per user for nonprofit for the analytic edition. There is no way we can do that. I am disappointed with the pricing developments recently in Salesforce and agree with Chris above. The robustness of the SF Foundation was that they gave the Cadillac edition to nonprofits–no “Lite” versions. I have so touted SF because of this generous stance. However, now, it seems like many nonprofits will be left out of some of the most needed and helpful advances. Where did you get this pricing info? Doesn’t make sense since that’s more than the regular price. Unless you’re saying per year. How much it would be if you are a not a nonprofit organisation? Thank you! Great post Judi! Yes, it is $98 per user/per year–all users in the org have to have it in order to enable it. So it is all or none. Well, at least that’s the full 80% off.